The individual chapters in this collection examine issues and problems of the Baroque, mainly focusing on aspects of reception in Austria from the eighteenth to the twentieth centuries. Contributions range from architectural history, such as Martin Raspe's discussion of Fischer von Erlach's use of Italian architectural vocabulary, to theory with Walter Seitter's study of 'Engagements with the Baroque by French philosophy: Foucault, Lacan, Deleuze'. Given the historical and historiographical difficulties of conceptualizing the Baroque, it is particularly refreshing to find a volume full of original contributions discussing various aspects of the issues at stake. Edited by Andreas Kreul, these essays are presented as number forty of the distinguished Wolfenbütteler Arbeiten zur Barockforschung. It is a pity that this series is not better known in the English-speaking world because this volume joins a number of excellent contributions relevant to art and architectural historians which contain important studies, such as that published in 1990 dedicated to Europäische Barockrezeption, edited by Ferdinand van Ingen, and the volume published in 1999 edited by Pierre Béhar and Helen Watanabe-O'Kelly, Spectaculum Europaeum dedicated to 'Theatre and Spectacle in Europe (1580-1750)'. Friedrich Polleross opens this collection with a chapter on the historical legitimisation of the Habsburg's 'Kaiserstil'. This discussion of the importance of Romanising style is aptly followed by Franz Matsche's more specific study of Johann Bernhard Fischer von Erlach's Roman inspired circular, domed buildings with colonnaded halls and their reception in Austria and other imperial territories. Martin Raspe's essay completes the trio and is dedicated to the ways in which Roman architecture was taken up and transposed in Austria, in a precise examination under headings such as 'Architecture and language', 'The fundamental principles of Italian architecture', and 'Erlach's church interiors, his facades, and pleasure garden structures'. The following two essays deal with further aspects of the Austrian Baroque of the late seventeenth and early eighteenth centuries: Anders Hammarlund's suggestive 'Towards an historical topography: Carl Gustav Heraeus on the path from Tessin's Stockholm to Fischer's Vienna' looks at inter-cultural relations between the two countries. 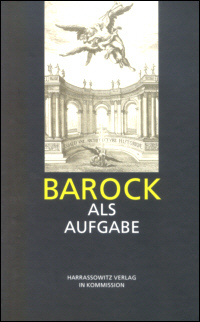 Barbara Arciszewska's chapter on 'Johann Bernard Fischer von Erlach and the Wolfenbüttel Library - the Hanoverian connection' shows how Palladian classicism became the favoured idiom in the Hanoverian court, which was Gottfried Wilhelm Leibniz's primary post, as part of their skilful manipulation of the codes of visual culture to support their ambitious political agenda. The nineteenth century is the focus of the next two essays: Martin Eberle's examination of the 'Political and sociological significance of Neorococo as an example of courtly furnishing in Stuttgart', which is a very welcome consideration of interior decoration, including chandeliers, wall coverings, and tableware. Christian Drude brings us to the fin de siécle in Vienna with 'Max Klinger and the Barock', analyzing a series of his allegorical engravings, mythological paintings, as well as his statue of Beethoven within its display context of the fourteenth exhibition of the Vienna Secession in 1902. The third section of this volume includes chapters dedicated to nineteenth and twentieth century historians who wrote on Baroque art and architecture from circa 1900 to the end of the twentieth century. Eric Garberson, for example, brings out particularly well the issues related to 'Baroque architecture and German national identity in art historical texts circa 1900'. This is followed by Joseph Imorde's long and thoughtful chapter on 'Barock and Modern' in the context of 'The problem of history writing as a characteristic of its time', explicating the significance of the work of well-known critics such as Heinrich Wölfflin by way of a much more detailed account of the period in which numerous other critics, now much less well know, are given fuller consideration. Gundula Rakowitz looks at responses to Fischer von Erlach's publication, Entwurff einer Historischen Architectur, in particular that of the contemporary architect Gianugo Polesello. The volume concludes with two short studies, the first by Dieter Wieczorek dedicated to 'research on simultaneous presentation: concepts of knowledge and forms of knowledge archiving' and that of Walter Seitter on 'Engagements with the Baroque by French philosophy: Foucault, Lacan, Deleuze'. The latter is important because it brings into focus the impact that Deleuze, in particular, has had on recent, theory based approaches to the Baroque, through his influential work on Leibniz and 'the fold'. This essay points the way towards the present where one might also consider the 'Baroque' beyond the decades of the 1960's to 1980's. These recent manifestations are set out in Angela Ndalianis' highly stimulating Neo-Baroque aesthetics and contemporary entertainment, published by MIT Press (Cambridge, Mass., 2004) in the series Media in transition. In fact, if one wanted to consider contemporary manifestations, one would look at the phenomenon of the neo-Baroque, which surely would be dominated by an analysis of the fashion industry, in particular, the work of Dolce & Gabbana, who have specifically promoted a neo-Baroque culture over many seasons. One might also look at other neo-Baroque figures in contemporary culture, such as Buffy the Vampire slayer. The other main cultural area that merits much further analysis is, or course, gaming, where Baroque 'underworlds' featured in the early games of innovative designers who conjured up dark, grainy, cave-like spaces to move through as an antidote to the hegemony of Hollywood's sanitized vision of the world. This volume offers useful new contributions to aspects of Fischer von Erlach's architecture and also represents a successful attempt to bridge the gap between seventeenth century Baroque and later 'Baroques'. It thus points the way forward to further studies of a phenomenon that has continuing resonance today with its renewed visibility in the contemporary culture of entertainment. Stella Bruzzi / Pamela Gibson (eds. ): Fashion cultures: theories, explorations, and analysis, Routledge, London/New York, 2000. Rhonda Wilcox / David Lavery (eds. ): Fighting the forces: what's at stake in 'Buffy the vampire slayer', Rowman and Littlefield, Lanham, 2002. Matthew Pateman: The aesthetics of culture in Buffy, the vampire slayer, McFarland, Jefferson, N.C., 2006. Astrid Deuber-Mankowsky: Lara Croft: cyber heroine, trans. Dominic Bonfiglio, University of Minnesota Press, Minneapolis, 2005 (original German ed., Frankfurt am Main, 2001).